Thank you to Ben Koush for compiling this list! Very cool... it would be cool to put together a map listing the remaining houses. Thank you so much for this list!!! Swenson & Linnstaedter, Swenson House, 3106 Brazos Street (I believe this was originally a home and studio, but HCAD lists it as a commercial building built in 1950. Must be it). George Pierce - Abel B. Pierce, Zwerneman (Lundgren) House, 16 Crestwood Drive (Additional building by Eugene Aubrey; remodeled by Gwathmey Siegal Assoc., once owned by Francois de Menil and featured in one of Gwathmey Siegal's first books, with photos by Richard Payne). The wild colors have been replaced for white, unfortunately. Kenneth Bentsen, Bentsen House, 2933 Del Monte Drive (not sure about this one; says constructed in 1935, remodeled in the 2000's, so it must still be there). I'm compiling photos of everything that remains. i believe the 70's house that replaced the Adler House is gone as well. It is now just a vacant lot. Goodwin House - Edward Goodwin, Jr. Doing a little digging on this today and found 11207 Tyne Ct. was sold in 2005 and demolished at some point after that. Does HAR go back that far that one of the realtors can look it up and save the old pictures if there are any? 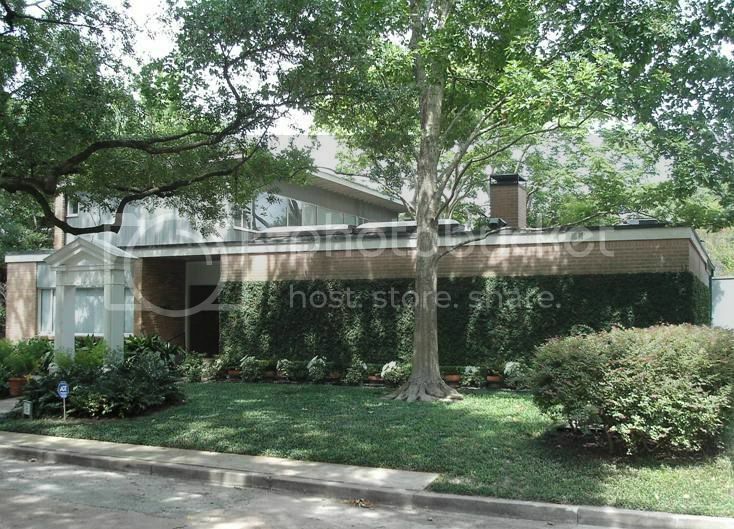 This house is surrounded by foliage and one of the biggest magnolia trees I've ever seen. 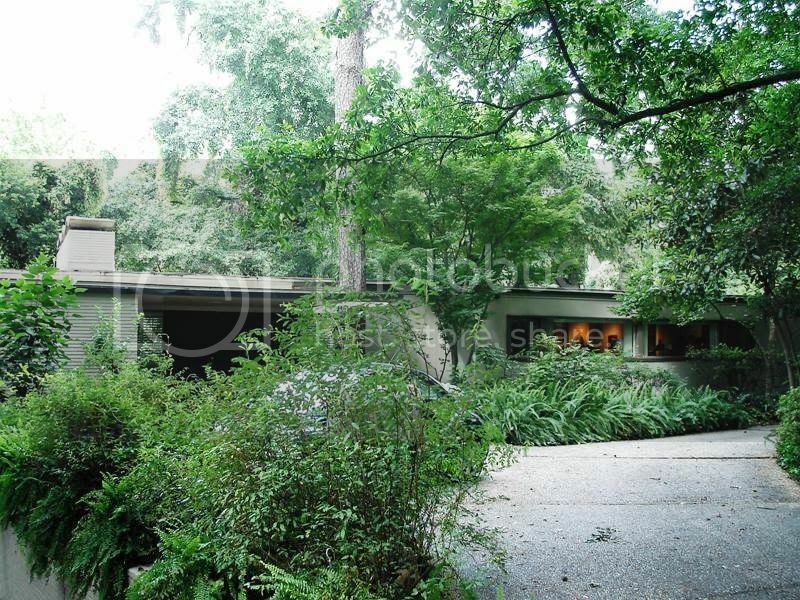 By the way, a neighbor in River Bend told me that the contemporary John Staub house at 1000 River Bend will not be torn down as I expected. It sits on 2 lots and I assumed it would be a goner. 4311 Bettis - It had a sign out front saying "Coming Soon" the something or another apartments, so if you want to see it you better go over there soon. It's very charming. This whole area is being rebuilt. There's a thread in Historic Houston about Mid Ln. and all the partying that went on there. I finally got a new scanner/printer! 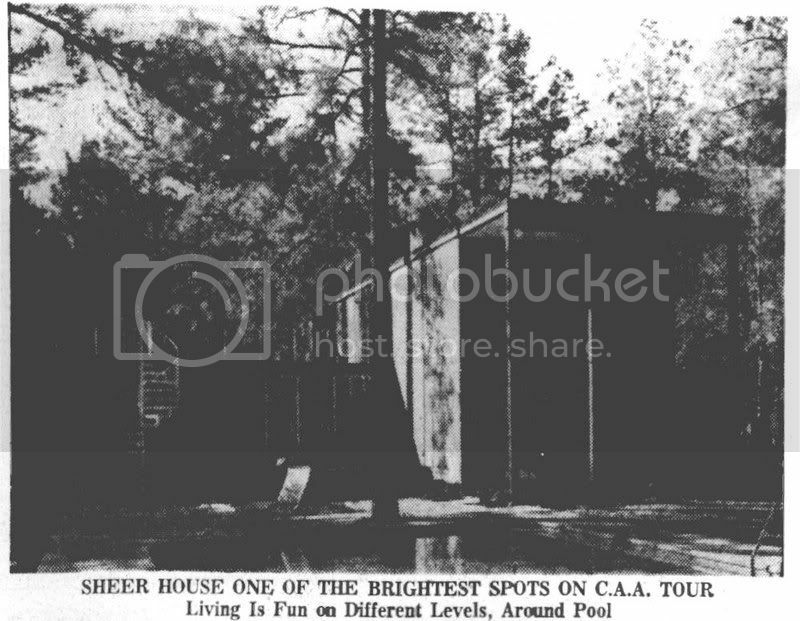 Here's a scan of an announcement of the Sheer House from the Post or Chronicle and a picture from when it was on the CAA Tour. Sorry about the quality of the picture. You have to use your imagination. Anyone who reads this that lived in the Sheer House or has a picture, please let me know or add it here. The Tharp House at 8218 Mallie Ct. I think we're getting close to getting pics of all that still exist! Thanks for the info, this is really great! Here's a scan of an announcement of the Sheer House from the Post or Chronicle and a picture from when it was on the CAA Tour. Daniel E. Sheer received the B.S. degree from Johns Hopkins University, Baltimore, MD, in. 1943, and the Ph.D. degree from University of Michigan. Daniel E. Sheer, neuropsychologist, Professor of psychology and Director of the psychology laboratory at the University of Houston, took his undergraduate training at Johns Hopkins University and his graduate training at the University of Michigan, where he also worked in the Laboratory of comparative neurology. The addresses and properties are unusual over there. I got lost trying to find the Sheer House when I tried to find it! it appears that 612 and 620 have a tiny sliver of property that extends out to hedwig, giving them hedwig addresses, though they face Long Timbers Lane. What this suggests to me is that it was all one (huge) property at one time. The rest of the addresses are 600, 608, ____, 624, 630, 638 - so they almost follow a pattern of 8. It says on HCAD that 612 was built in 1970 (possibly after Mr. Sheer's passing, part of the property was sold?) then years later the rest of 616 Hedwig and was sold, divided and demolished with the road Long Timbers going in and the rest of the properties being built? The oldest of Long Timbers Ln appears to have been built in 1984 according to HCAD. Now that's the deepest I think I can get into it tonight... I've been told that sometimes builders change the addresses if they can to avoid confusion with the old house or to get a fresh start on a property. Suffice to say, I would love to see some quality pictures of the house. 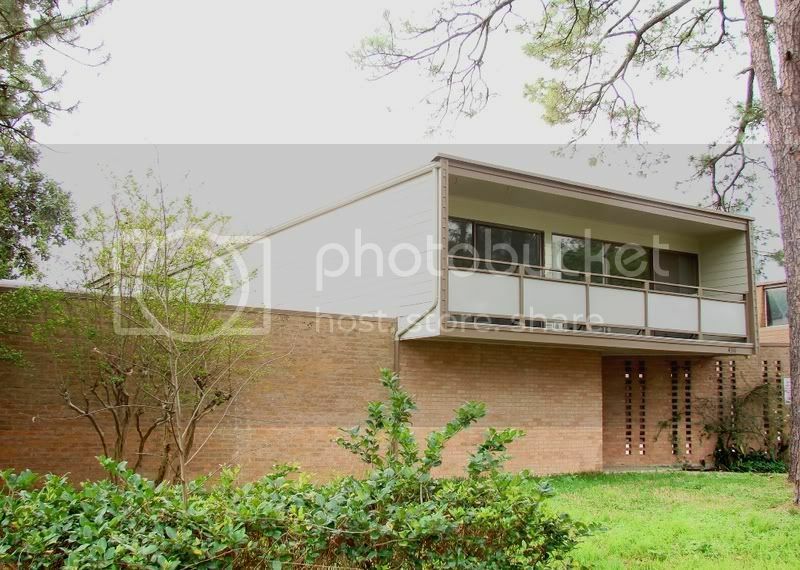 Not sure where the article is from; maybe Texas Architect? Wow thanks, Willowisp, excellent list. I just got a new GPS so I used the addresses on tour X 1961 to test it out. to go from one property to another. if the house is still there and what it looks like. For tour X all but one of the houses are still there. just McClelland House, 11207 Tyne Court is gone. But even if the house is gone you can still get a sense of flavor of the neighborhood and other homes of the period. Not to say there isn't pressure in the neighborhoods where the others are still standing. 7623 River Point Drive has a sign stating builder will build to suit and 16 Crestwood Dr has a construction fence around it. architecture is replacing some of the old ones. All text and photos courtesy of Architectural Record. Yeah, I forgot...Jason did all the real legwork on this stuff, I just scanned it. The Schmiek house on Willowick by Lloyd & Morgan is still there, I just haven't been able to get a picture of it. The Owsley House, Carter House and the other remaining mod on Briar Hollow were recently sold to a large family that intends to keep them. The Owsley house was having new landscaping put in last week. This came from William R. Jenkins' personal scrapbook. Thanks to Jason Smith for tracking it down, and Melinda Jenkins. 403 Blalock is still there. Listed as 3 Dunnam on HCAD. The original architect was A.A. Liefeste, with later additions by MacKie & Kamrath. The Thompson house by Wilson, Morris, Crain & Anderson on Tilbury was demolished at some point in the last year or so. J.W. Evans House - 3118 Georgetown. Any info about Evans would be much appreciated. I've never heard of him or anything about him. 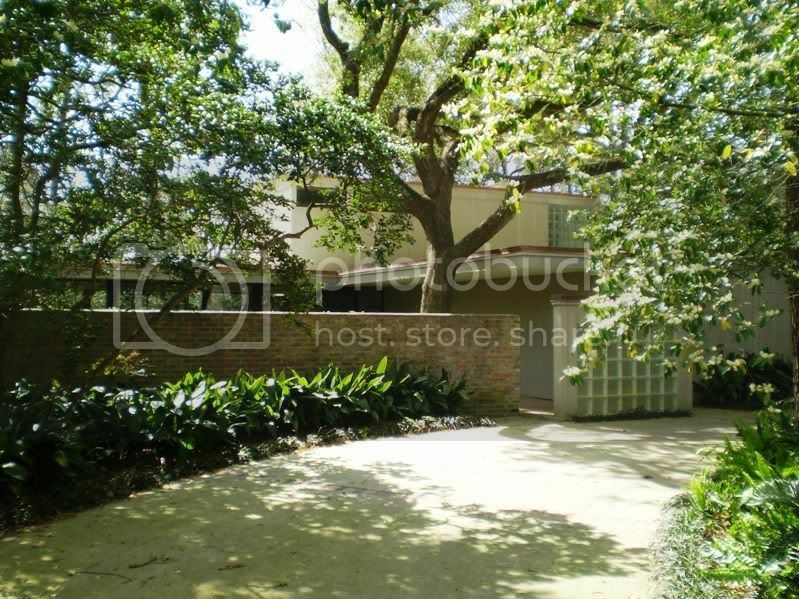 A note on another CAA house: Kenneth Bentsen told me that the house at 2933 Del Monte that was on the tour in 1965 was initially a very bland traditional house (his words) in River Oaks, which is exactly why he bought it. He completely redid the interiors in his simple, yet comfortable modernist style and lived there until the 1980's, when Bentsen designed a contemporary house for his family in Glendower Court. Thought I would update this. Cowell & Neuhaus, Stude (Stevenson) House, 56 Tiel Way. Sympathetically altered. A. 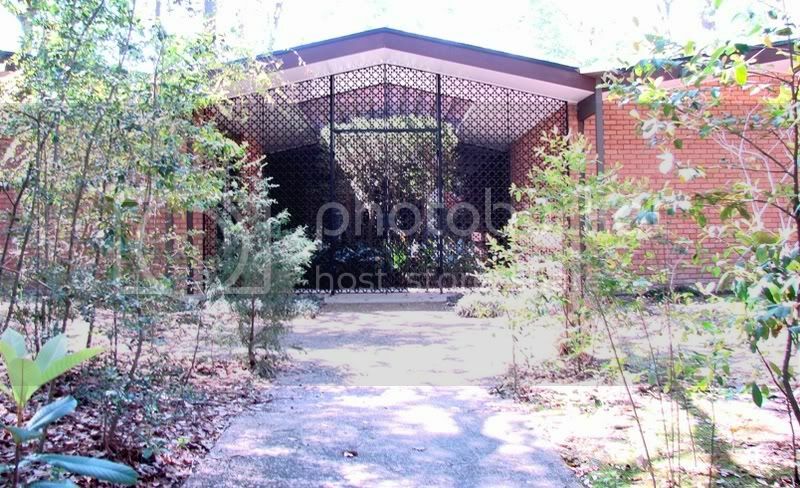 A. Liefeste, Jr., Lefieste House, 403 Blalock Road (Demolished). Address was changed to 3 Dunnam. Additions were done by MacKie & Kamrath. Hamilton Brown, Selig House, 3715 Inverness Drive. Unknown. Current house is traditional. HCAD says 1984, but that's just how far their records go back. Burdette Keeland, Pryor Apartment, Kipling Apartments II, 2719 Kipling Street. Pretty sure these are gone. There are townhouses on that address. Robert Wilson, Wilson Apartment, Bettis Apartments, 4311 Bettis Drive. These are still standing, but appear to have been converted into offices/apartments for a religious group. Edward Goodwin, Jr., Goodwin House, 3 Leisure Lane (Demolished). Travis Broesche, Walser House, 411 Fall River Road (Demolished, was Mod of The Month in 2016). 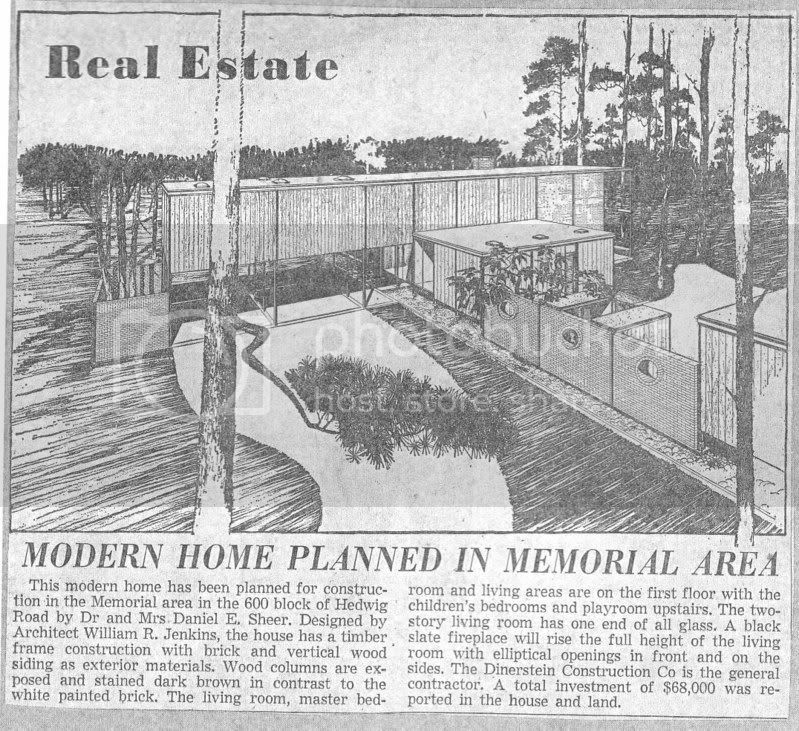 William Hoff, Huvard House, 12526 Old Oaks Drive. I read somewhere that this house was by Jenkins & Hoff, but can't remember where. Either way, this house still stands and in good condition. Bolton & Barnstone, Owsley House, 65 Briar Hollow Drive. Owned by the Bone family, along with the Carter House at 62 Briar Hollow Lane and another house next door attributed to Ralph Anderson/Wilson, Morris, Crain & Anderson. MacKie & Kamrath, Ballantyne House, 2 Tiel Way (Mostly demolished but apparently going to be rebuilt or something by architect Chris Robertson). Howard Barnstone & Partners, Melcher House, 13 Tiel Way. This house is still there but has been significantly altered in a sort of Mediterranean style. 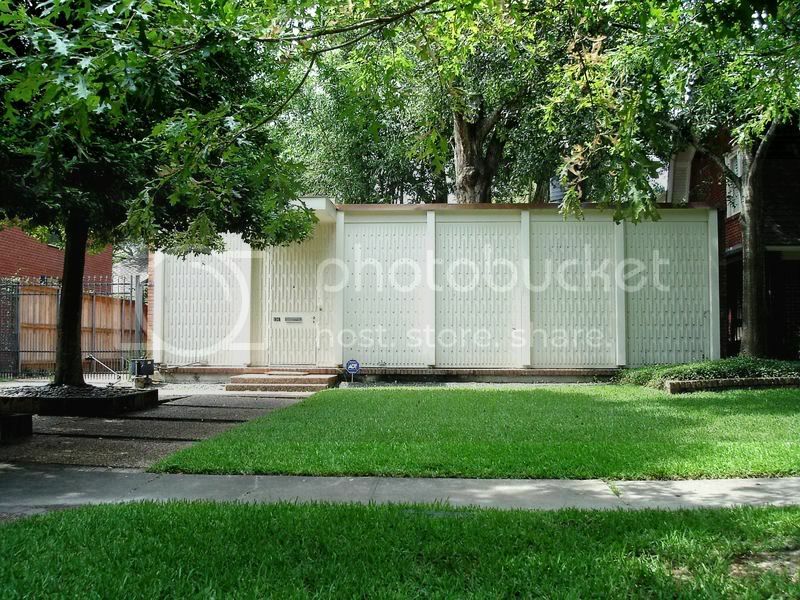 Jenkins & Hoff, Sheer House, 616 Hedwig Lane (unknown, neighborhood has changed considerably). This one remains one of the bigger mysteries. 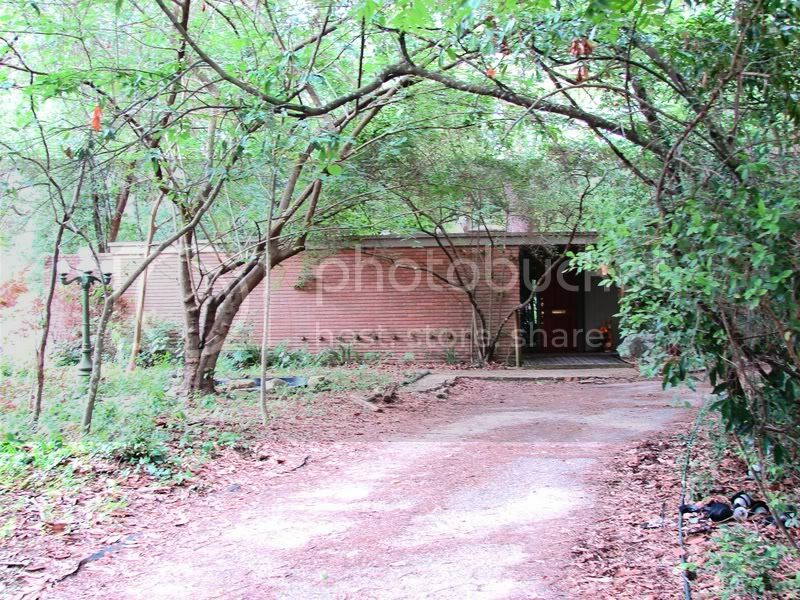 I'm still not sure what the deal is with this house, whether it's been heavily altered, completely demolished, or is hidden on a wooded lot out of view.